I just heard an incredible story that brought tears to my eyes. It sounds like something from a Hollywood script. This week in Women’s Softball Western Oregon was playing Central Washington with the winner of the game making their first appearance in the NCAA Division II tournament. Sara Tucholsky, a senior at Western Oregon, was just 3 for 34 this season at the plate and in her entire softball career she had never hit a home run, until yesterday. A three run shot over the centerfield fence to put Western Oregon up 3-0. The unsung player, hitting their first home run ever to send her team into the playoffs. Great story if it ended there, however that was only the beginning. Sara was so excited that she pulled a Mark McGuire on her home run trot and missed first base. When she planted her foot to go back and touch the bag her right knee gave out and she went to the ground. Her coach wanted to go check on her but if any of her team or coaches touched her she would be called out. It was quickly obvious that she was going to have trouble crawling back to first much less makeing it all the way around to home plate. The umpire told the coaches that according to the rules if Sara could not make it around the bases they would have to sub in a pinch runner at first base and her hit would be recorded as a two run single. The Western Oregon coach, heartbroken, prepared to make the substitution when over his shoulder a voice said. "Excuse me, would it be OK if we carried her around and she touched each bag?" 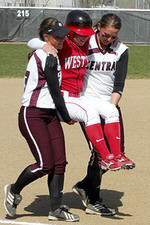 It was Central Washington’s first baseman Mallory Holtman, the all-time home run leader in the Great Northwest Athletic Conference. Since there was nothing in the rules against the opposing team touching a player, in one of the most incredible displays of sportsman ship I have ever seen, Mallory and shortstop Liz Wallace picked Sara up and started the slow trek around the bases, reaching home plate to a standing ovations from the fans. Mallory Holtman is my hero. Sara’s home run was the difference in the game as Western Oregon won 4-2. But here is the thing, next year no one other than the teams involved will remember who won, or even the score, but this act of sportsmanship will live on for a long, long time.